Top surgeons perform high-stakes surgery. The surgeons must stop a patient's heart, chill his body and drain out his blood before they can operate. 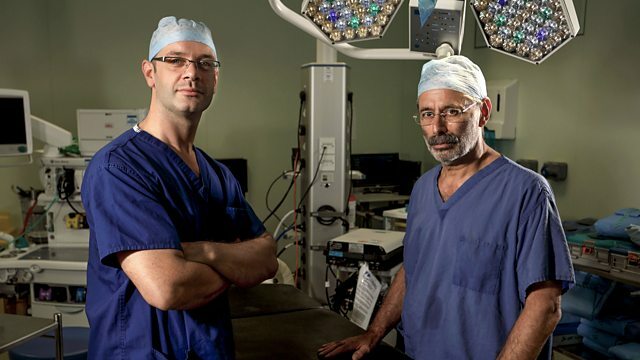 The second episode follows some of the country's most daring and skilled surgeons as they perform fiendishly complicated life-saving surgery. Going beyond the theatre doors at the Queen Elizabeth Hospital Birmingham, this episode features two procedures so formidable that they would not have been attempted even a few years ago. Surgical teams at the Queen Elizabeth are constantly pushing the limits of what is possible. But despite state-of-the-art diagnostic scanning, sometimes cancer surgeons don't know exactly what they are up against until they open the patient up on the operating table. Even with the most meticulous planning, sometimes they must resort to taking critical decisions live in the theatre. 74-year-old Jasmine Harkness has been referred to the specialist sarcoma unit with a vast tumour in her abdomen, weighing more than three stone - a third of her total body weight. It is consuming her, displacing organs including her stomach and liver. Unless it can be removed, she has just four weeks to live. Sarcoma specialists Sam Ford and Professor David Gourevitch can't be sure whether they will be able to save Jasmine until they open her up and inspect her anatomy. Such is the risk of this surgery - five years ago they would not have embarked on this intervention. Sue Sinclair, lead anaesthetist and matriarch of theatre, keeps the others in check - working alongside them as they battle to detach the tumour from Jasmine's organs and blood vessels, and remove it intact. Whenever it presses heavily on vital blood vessels, Jasmine's blood pressure plummets, placing her life in grave danger. It will take unwavering focus to keep her alive. The tumour has grown so invasively that it has crushed and displaced Jasmine's internal organs. Sam and David have a puzzle on their hands to identify what and where everything is. At times, dark humour is the only way to release the tension as they grapple with blood, guts and mind-boggling complexity.